The alpine experience right here in Canberra. Whether you are a professional on the slopes, a newbie to the sport, or partial to a good hot chocolate by the fire, we have you covered. We love the mountains just as much as you do. That's why we are making the slopes more accessible! We want to heighten the experience when you do manage to get to the snow. 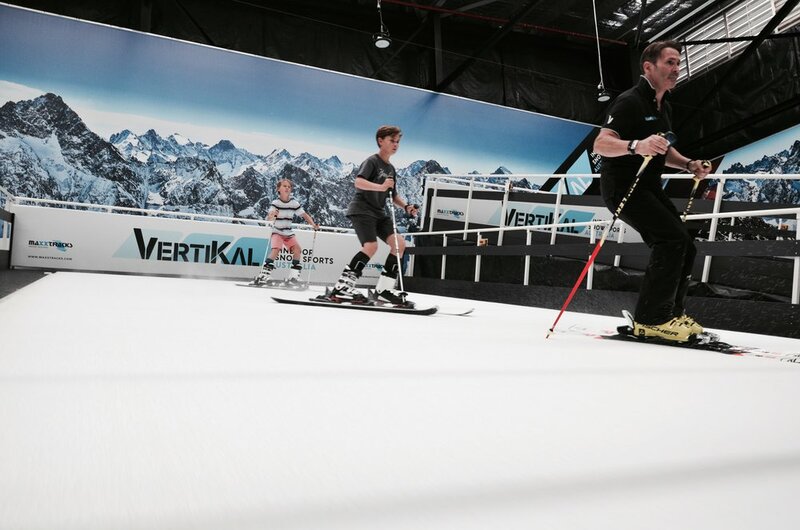 Ski and board all year 'round, have fun, keep fit and experience your own little piece of alpine life right here in Canberra. And for the advanced... once you get a feel for the mats you can train on your own for a discounted price! Yearning for mountain vibes? Join us for some authentic après fun before or after your workout. We’re serious about our skiing and boarding, and we’re also serious about fun times and talking about it at day’s end! The good times: connecting with friends around our fireplace with good tunes, warm drinks… and cold ones. There’s nothing better than sharing a great snow day… or even that time when you nearly slid off the road because the chains didn’t fit. Apres-ski -- the Nordic tradition of enjoying yourself and relaxing after a solid day out on the mountain. Come and join us! Looking for a venue unlike anything else in Canberra? Whether you are looking for a relaxed environment for after work drinks, or an all-out themed party, we have something everyone can ‘après-ciate’. Our 900 SQM venue is perfect for a wide range of events- from intimate birthdays all the way through to large scale launch parties and company wide Christmas events. Boasting natural light, European après vibes, Indoor skiing and snowboarding and toasty fireplaces, you ‘snow’ your event will be the talk of the town. Are you a personal trainer or fitness instructor? Our health and wellness space is also available for hire! If you’re interested in running classes or workshops, we would love to hear from you. With a cafe on hand for post-class hangouts and ample room, it’s a perfect and unique environment to foster a rounded experience for your clients. Sign up with your email address to receive news, updates and mountain inspiration. Design by Shaylie Roach Co.